San Diego CA, Handsome Revolution is coming your way! San Diego California, Handsome Revolution Project is headed your way and we need models/particiapnts. We need your help to get there! We are currently Crowdfunding for this trip and will need your help with donations, sharing posts and our website. *Recommendation for queer friendly/accessible areas to stay where photoshoots will be done outdoors. *Events or organizations to contact for help planning show and promoting our visit. We are featured on the Huffington Post! Behind The Scenes (BTS) Shooting in Berlin, Germany. Behind the scenes with photographer Miki Vargas shooting for the Handsome Revolution in Berlin. One of our Handsome Participants featured on Curve Magazine! Super excited to finally share the page where Tiffany is featured on this issue of Curve Magazine. 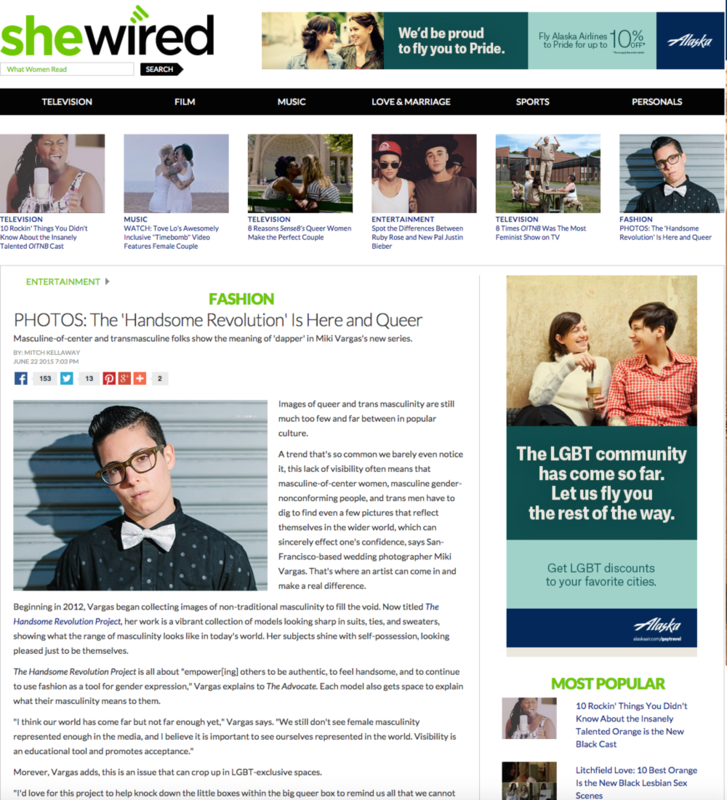 The photograph featured is from a second shoot we did for the Handsome Revolution Project. Thank you @Curve Magazine. We are planning or next trips and we want you to help us pick the location! Vote for your city, help us get funded and hope we see you soon. This past week in celebration of Pride Week we were invited to participate as part of this awesome event. Fashion, music and art! Our favorite. We had a change to mingle with some of our participants and network. The images looked fantastic on a wall all of their own. I was overwhelmed by everyone's support and positive feedback. It really warms my heart when people remind me of the importance of what this project is doing. I am fueled by the appreciation and the desire to see more. I am excited to see the project get fully funded so that we can visit as many places as possible and continue to bring these images to you all. Thank you The Advocate magazine. Yet another fantastic article, so proud to see the project getting around just like we wanted it! Please share. Hello everyone, we have finally launched our GOFUNDME campaign. We have big plans for this project. A traveling exhibit! At least 10 more US cities and we are taking it internationally! You read it right, we have received a lot of emails and support from a few international cities and we want to head your way. Anything helps! And please continue to share our campaign and project website! Thank you to all who have helped this project become a reality. I'm so incredibly grateful to have had the opportunity to have had the opportunity to chat with the HuffPost and to see the project finally reaching a larger audience as I had wished from the beginning. Thank you all for your support. Recently while visiting Chicago, I was told some folks disagreed with the use of the word "bois" due to its history. I have recently been working on changing the name of the project but have found that everyone has an opinion about the name and it usually is not a positive one. With that being said since this is a personal project I will continue to think of names that I fell could be more appropriate and that will hopefully not shy anyone away from participating in this project. Please read what all the participants have shared with us, their feeling and thoughts and consider being a part of this project. What an amazing year it has been. I cannot express how grateful I am to have had the opportunity to meet incredible individuals throughout the country. A very special shout out to Saint Harridan for sponsoring the project this past year, as most of you already know our coming together was a match made in heaven! I learned a lot this past year. I learned about others and about myself and continue to be reassured by your all that this project is needed. As we approach 2015 we begin to think about where to go next? I want to reach out to you and ask for your thoughts on places we should visit. We also need all the help we can get to get us to those locations. We will be working on a funding campaign to help us get the 2015 tour started, so please stayed tuned! Again, thank you to all for your support and to those of you who participated! See you all in 2015. Finally got to launch the new site and I feel super excited about it. I love that I am able to showcase this awesome body of work. This year has been pretty amazing. Traveling is fantastic and exhausting at the same time. I love that I get to see new places and meet new people. I have now photographed in five (5) different cities and have gained tons of knowledge on how to make this better for next year's tour. I am excited to plan openings for those 5. Again, share the project with your friends.